Be careful when shopping for cheap guitar strings! While price isn't always an absolute determiner of quality, there are some very poor products at the budget end you should avoid like the plague. If you're gigging, you want guitar strings that are affordable, durable and bring out the best in your guitar's tone. Even if you're just a bedroom player, choosing the right strings will make your practice sessions easier and more fun. So here are the best cheap guitar strings as rated by literally hundreds of users, many of whom are experienced players and guitar technicians, so you can be sure of the quality when it comes to tone, intonation and longevity. 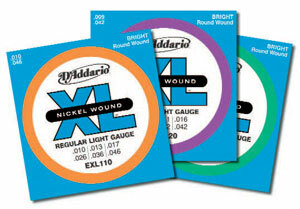 Hands down the best value electric guitar strings on the market, D'addario's XL Nickel range are long time favourites among experienced players. With Ernie Ball's Slinky range not far behind, the XL's take the lead on consistency, long life, sound and price, at under $4 per pack (online) or 3 set packs for under $10.50. These are your basic "every day" electric guitar strings. The first, and to many the most important box checked is quality consistency. Many users (myself included) have, by all intents, confidently settled with D'addario XL's for life because of their consistency. You always get that crisp, clear and bright yet gutsy tone every restring. As your ear develops and you find your tone, you will notice any inconsistencies, and many have found other makes of cheap guitar strings rather unpredictable in that sense. For the gigging guitarist on a tight budget, XL's are a solid choice. They offer the best compromise between longevity, feel, sound and price. Particularly taking note of comments from users who have tried several brands, it's clear that the less obvious features - minimal, air tight corrosion-free packaging and even a unique serial number to confirm the pack's authenticity on their website (not necessary, but there for peace of mind) - all go towards reaffirming the value of these strings. Some find the individually coloured string balls a bit "goofy" and unnecessary, but to some they are useful in quickly identifying the confirming the correct string gauge. I'm not embarassed to admit I still refer to these, (although now almost subconsciously!) to confirm they have packed the correct gauges. With individually wrapped strings, preferred by other brands, with the uniform gold or silver balls, it's not always immediately obvious if two strings of the same gauge have been shipped in the pack by mistake. By far the most consistently positive comments are in regards to how long the XL's last, not just on physical string life but also how long before any noticable deterioration in tone. Personally, ever since using D'addarios, I struggle to remember when I last broke a string. Reliability is obviously important for giggers and those who have used them for any length of time develop a strong trust of XL's. 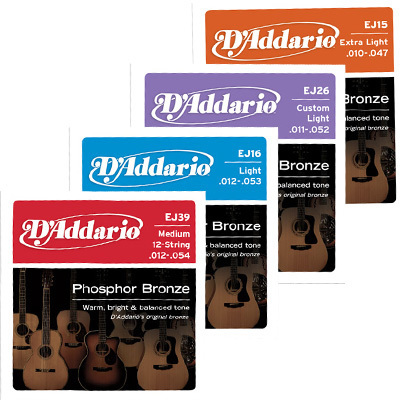 D'addario do it again... this time with their Phosphor Bronze acoustic guitar strings. Recommended for the same reasons as its XL's - corrosion free packaging, well balanced tone and great value single and multipacks. A favourite of qualified techs and expert players. Users appreciate the consistency of Daddario's Bronze Phospher acoustic strings in the same way they do the electric XL's. There's no risk of oxidation as with other cheap strings packaged in paper envelopes, thanks to the corrosion eliminating air tight packaging. This facotry freshness is an often overlooked benefit and really does impact the longevity of your strings, both with tone and durability. Looking at reviews where players have switched from brands such as Martin and even the more prestigious Elixir, D'addario BP's deliver a favourably balanced tone, with plenty of depth and mid-high end response. Brightness is retained longer than other brands, so there's no frustration of losing that irresistable zing after a mere week of fitting new strings. The balanced tone also means fingerpickers and strummers alike can easily find their sound. Those with cheap acoustic guitars (which this humble site does have a certain bias towards!) will find the BP's breath new life into what was perhaps a restrained tone due to poor quality stock strings. If anything, these strings prove that so much of your tone is locked into the strings and the D'addarios will open it up better than other brands. Surely the most flattering comments are from those more experienced players and techs who have tried countless brands over two and three decades and just discovered D'addario. Those who do make the switch find not only is their a vast improvement in tone, but also comfort, with the BP's supporting a smooth action and ease of playability with less overall tension than its competitors. The low price of Pro Artes means you can change them more frequently to maintain that fresh, new string tone, especially important for recording and gigging players. 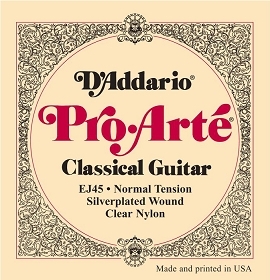 However, like its acoustic and electric offerings, D'addario are again praised on how much life you get out of each set of their classical guitar strings. Many players discover the true tone of their acoustic after switching to Pro Artes. It's true that a decent budget classical guitar will often be harshly judged based on poor string choice. String up with Pro Artes and hear the difference. There's not much to say that deviates from the reviews above - the consistent output, anti-oxidising packaging and great balanced tone is all there. Add to this a choice of light through to extra hard tensions, and many classical players are more than happy to settle on Pro Artes for the forseeable future, using the money they save for a rainy day (...or new gear).